The Leftists think it’s a free-for-all to attack anyone that supports President Trump and/or his policies. Many have weighed in on the Kathy Griffin career-imploding move, but it was former Jeopardy champion, Ken Jennings that really stepped in it. President Trump’s tweet about Barron having a difficult time when he saw the image was enough to make Jennings’ claws come out. Ken Jennings was made ‘famous’ by being the longest-running winner on the game show, Jeopardy. He won 74 times before being defeated and amassed $3,196,300. Jennings, a children’s book author, decided to classlessly attack an 11-year old boy. Well, you know outspoken Donald Trump Jr. wouldn’t let that attack on his Father and little brother go unchallenged. Donald Trump, Jr. has slammed Jeopardy! champion Ken Jennings for poking fun at his little brother Barron Trump. The former game show contestant took to Twitter and responded to reports President Trump’s 11-year-old son thought the fake severed head Kathy Griffin was holding in the horrifying photo was really his father. Barron’s older brother Don Jr quickly responded, saying: ‘It takes a real man to pick on an 11 year old. Call them out on their crap. Bullies that pick on kids. And this guy’s supposed to be a genius? 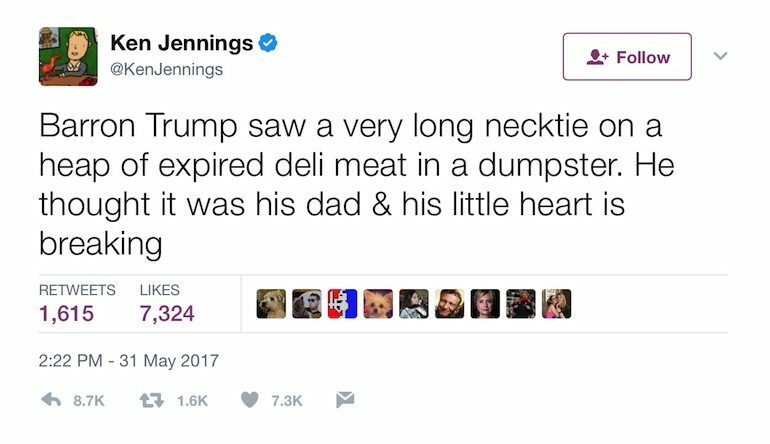 Jennings responded to Don Jr.’s tweet. And he’s not backing down. Instead, he mocked Don Jr.’s love of hunting in a bizarre tweet. You bullied a child and you are supposed to be a children’s book author. Do you think that proves your masculinity or that you’re a major douchebag? It’s also what we’re calling ‘Pulling A Kathy Griffin’ — what was previously known as a ‘career limiting move’. Ken, Honey, there haven’t been enough white rhinos since the foundation of the world to prove that. Besides, your 15 minutes of fame were up when you finished that stint on Jeopardy. QUESTION: Do You MISS The Days When The LOSER Disappeared For Over A YEAR?